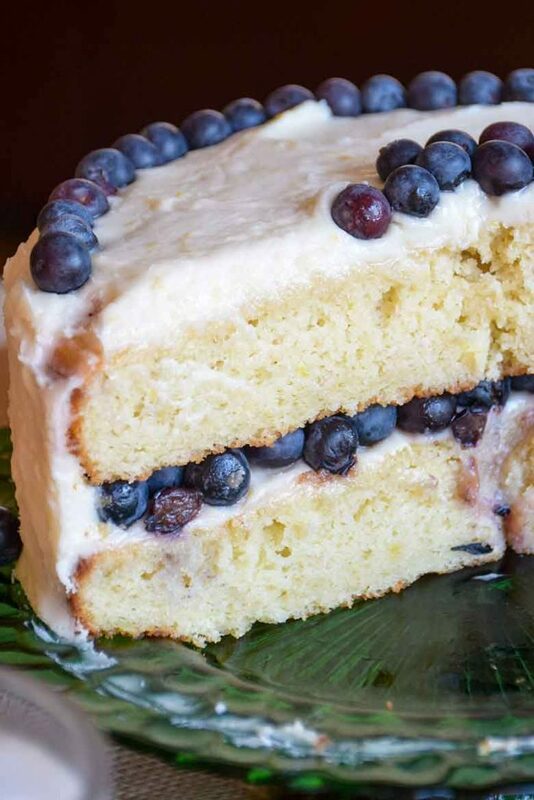 Banana Cake is full of banana flavor with fresh blueberries between the cake layers. The banana cake is moist with a slightly dense crumb and oh so delicious. 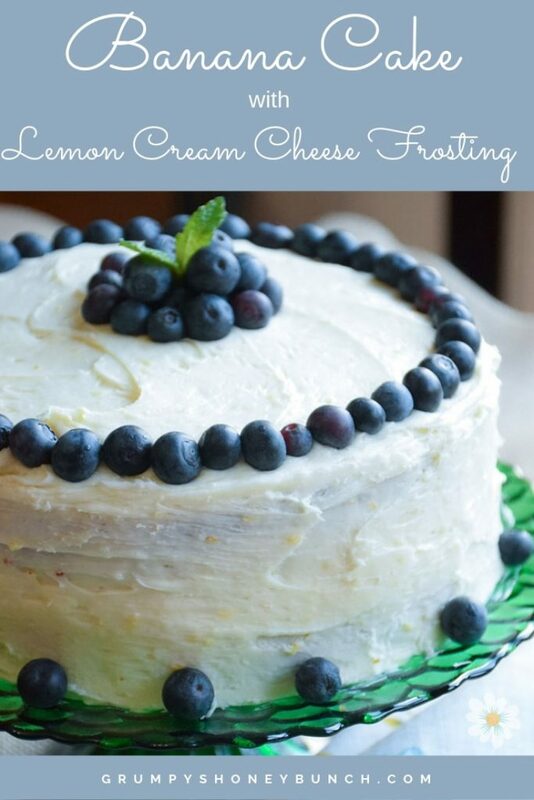 It is then frosted with a delicious and creamy Lemon Cream Cheese Frosting full of fresh lemon juice and citrus zest. 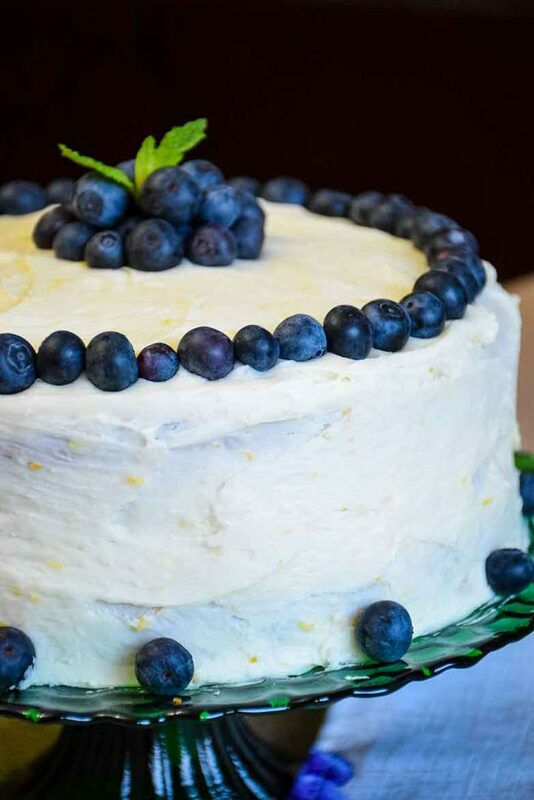 The finishing touch is more fresh blueberries to decorate the top and edges of the cake! This banana cake is a perfect birthday cake or just any day dessert. I like to serve it in the spring, which is why I happened to make it for my mom’s birthday, which is also in the spring! 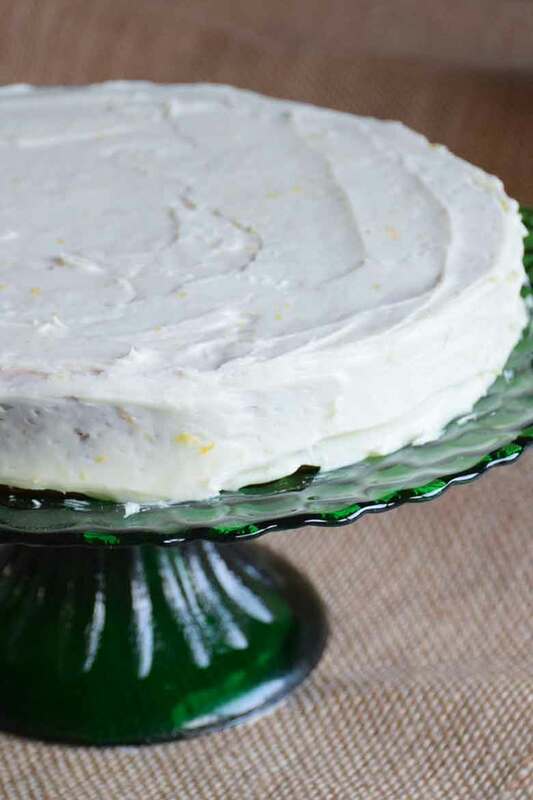 The citrus flavor in the frosting compliments the banana cake, making it a great pairing. I made this particular Banana Cake with Lemon Cream Cheese Frosting for my Mom’s birthday in 2010! 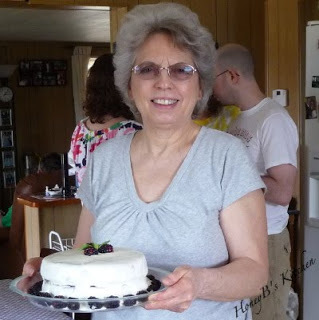 I just love the photo below of her all smiles and holding her birthday cake! It is a well known fact with my family that I love blueberry and lemon combination. After all, my favorite cookie of all time is my soft and tender recipe for Blueberry Cookies with Lemon Glaze! This Banana Cake and citrus flavored icing goes well with just about any fruit. I have made it with blackberries, raspberries, and blueberries. I’m pretty sure strawberries would go well also! The original recipe is a Cooking Light recipe that I have slightly adapted to make my own. It is not only delicious, but can really be a showstopper for a birthday dessert and is one of my favorite banana cake recipes! What is a crumb layer? A crumb layer is a thin layer of icing spread onto your cake layer. Once this layer has been added to your banana cake, it is refrigerated to firm the frosting up. Then, when you add the last frosting layer, you will not have crumbs in your final coat. Do I have to add a crumb layer to my banana cake? If you don’t care that your cake has crumbs in the icing, then no. The crumb layer is basically a visual, to make the cake more pleasing to the eye. Can I use a regular knife to frost my banana cake? You can, however if you want a pretty cake, the best type of frosting utensil to use is an angled icing spatula. The angle in the spatula makes it easy to go around the cake and gives it a smoother look. The easiest way to perfectly frost a this Banana Cake! Place your first banana cake layer on the cake plate and place a thin layer of frosting using a large angled icing spatula. After icing your first layer, place a layer of blueberries on top. Take the unfrosted top layer of cake and place it on top of the bottom layer. 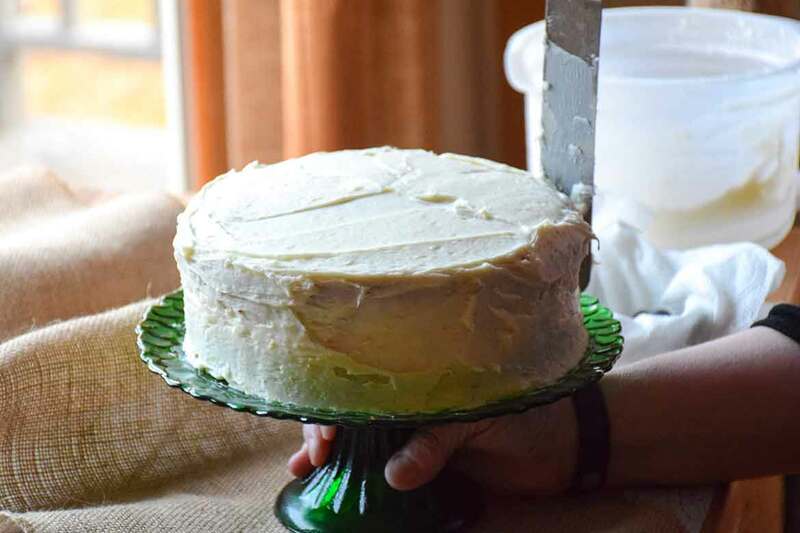 Using your cake spatula, add a crumb coat to the top layer and sides of your cake. Refrigerate at least 30 minutes. 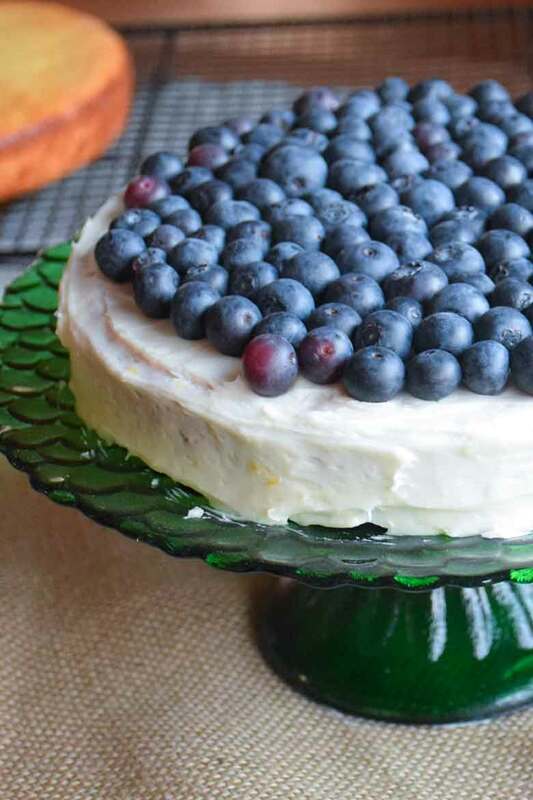 Remove cake from refrigerator, add last layer of frosting and decorate with blueberries as desired. Citrus is so uplifting! 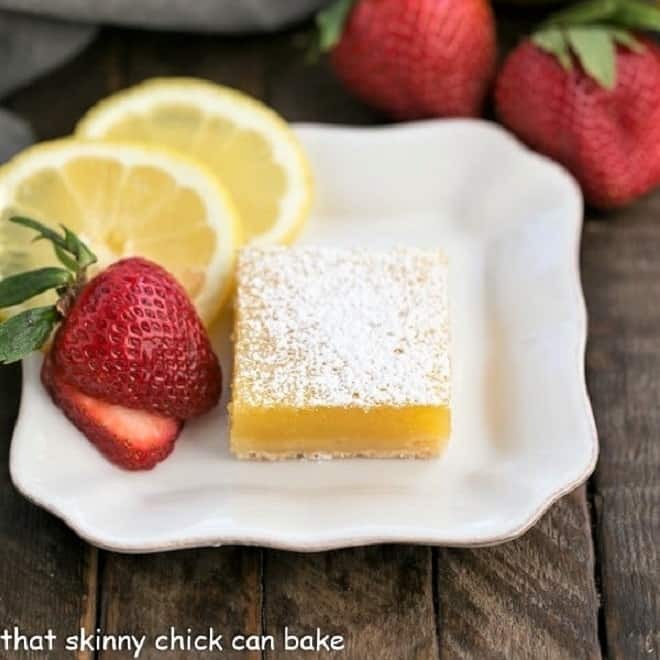 There are just a few of my citrus favorite recipes on the web! 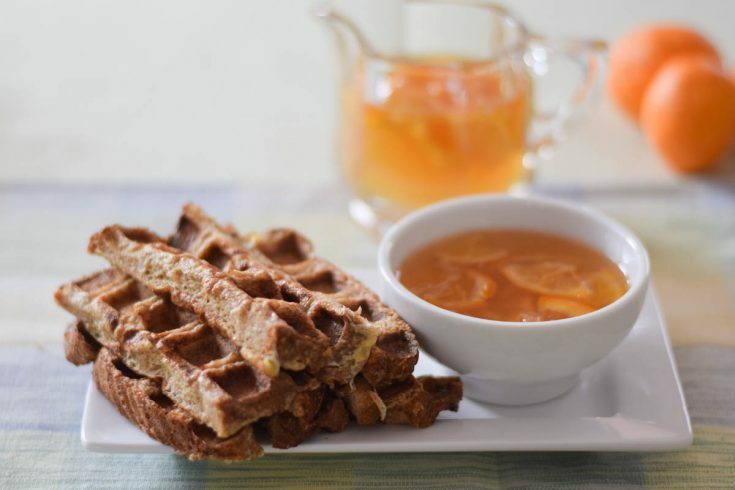 A basic french toast recipe made in the waffle iron and served up with some citrus infused maple syrup! 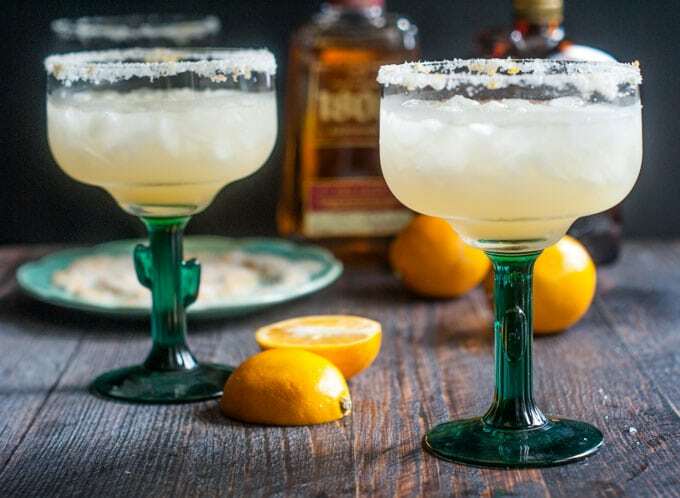 This copycat recipe is pretty easy to make and bursting with tangy lemon flavor. The buttery shortbread crust is topped with a thick, luscious layer of citrus for a sublime treat! 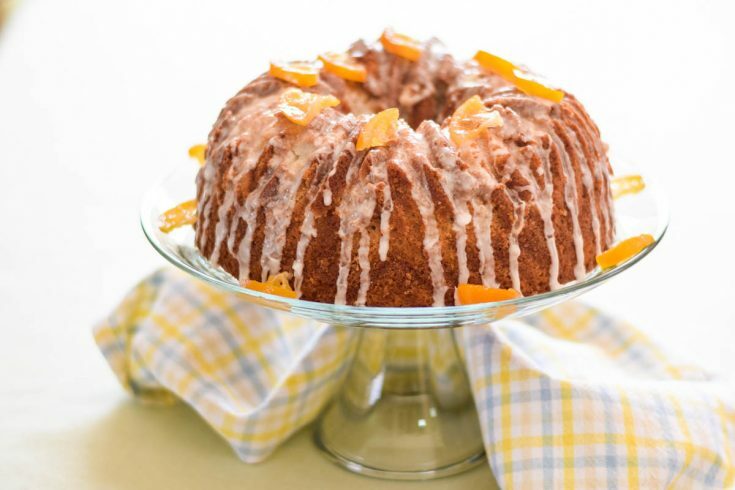 A dense cake with a close crumb full of lemon flavor and drizzled with a glaze made with Meyer Lemon infused maple syrup. 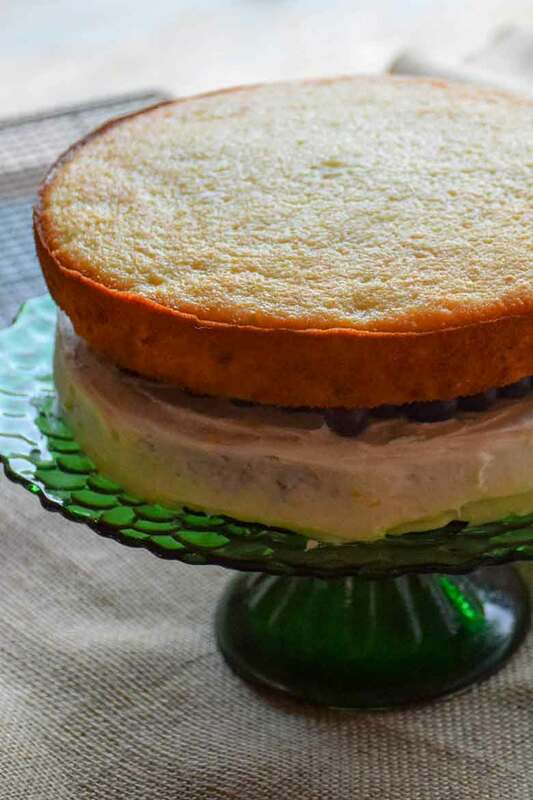 A layer banana cake with fresh blueberries between the layer and iced with a lemon cream cheese frosting. Recipe is adapted from Cooking Light. Coat 2 (8-inch) round cake pans with cooking spray; line bottoms with parchment paper then spray with a light coat of cooking spray. Place granulated sugar and 1/4 cup butter in a large bowl. Using hand mixer, beat at medium speed until well blended. Add eggs, 1 at a time, beating well after each addition.Lightly spoon 1-3/4 cups flour into dry measuring cups, and level with a knife. Combine flour, baking powder, and 1/2 teaspoon salt, stirring well with a whisk. Combine greek yogurt, water, banana, and 1 teaspoon vanilla. Add the flour mixture and buttermilk mixture alternately to the sugar mixture, beginning and ending with flour mixture (mix after each addition just until blended). Bake cake at 350° for 25 minutes or until wooden pick inserted in center comes out clean. Cool in pans 10 minutes on a wire rack; remove from pans. Peel off parchment paper. Cool layers completely on wire rack. Combine cream cheese, 2 tablespoons butter, lemon rind, 1/2 teaspoon vanilla, and dash of salt in a large bowl. Beat with a mixer at high speed until fluffy. Gradually add powdered sugar; beat at low speed just until blended.Place 1 cake layer on a plate, and spread with 1/3 cup frosting. 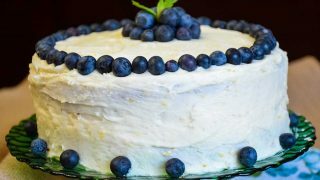 Arrange blueberries in a single layer over frosting, and top with remaining cake layer. Spread remaining frosting over top and sides of cake. 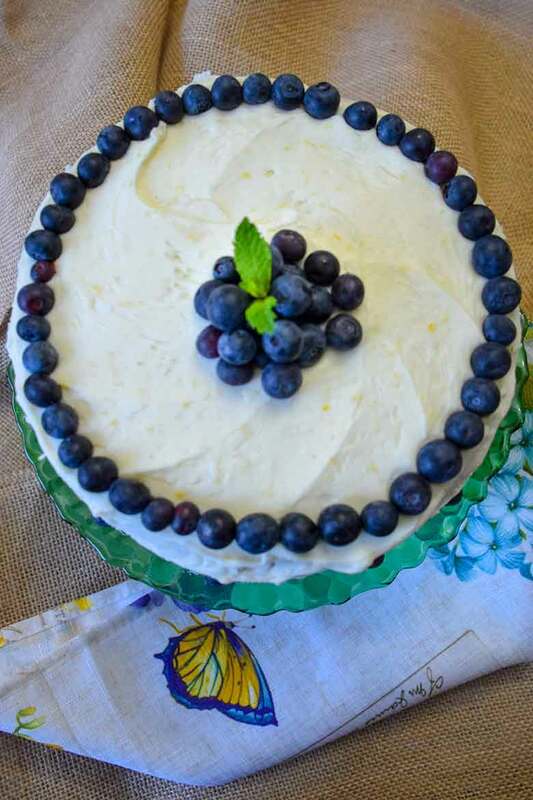 Decorate top of cake with more blueberries if desired. Store cake loosely covered in refrigerator. « More Steamy Kitchen addictions to work through! wow what a gorgeous cake, and your mom looks like a sister not your mom wow!!!! The cake is luscious looking great combo of flavors here with the lemon frosting added, Happy Birthday Shelby's sister oops mom!!!! and many more have a wonderful day! The cake looks so good! Happy birthday to your momma! I made banana cake for my son's birthday a few days ago, as I have done at his request for the past 20 yeas. They are so very good, and yours looks simply wonderful. Many thanks for sharing! Are there any leftovers of this magnificent cake? I'm going there right now!! Being a new grandma I can't help but wonder what Gavin is going to call me. What a beautiful cake…love the fresh berries! this looks so delish!!! Pretty! Happy Birthday to your mum! This cake looks absolutely delicious. Happy birthday to your Mom! Cute story. Happy Birthday to your mom! The cake looks amazing and Im sure she loved it! I love white frosting better then chocolate! That's one amazing looking cake, congrats on you moms birthday!! Wow, talk about hitting the Mother Lode! Gotta find some paper for the printer! Wonderful and I can't wait to try this. Blackberries are a household (me and My Mountain Man) favorite! Happy birthday Momma! Gorgeous cake!! Happy Birthday Momma! That cake is beautiful!!! aw, happy birthday to your momma! sweet post! the cake looks wonderful. Happy birthday to your Momma. You look so much like her Shelby! The cake is gorgeous with those huge blackberries surrounding it. I've bookmarked this as I can't resist any banana cake this lovely! Happy Birthday to your Mom! The cake looks wonderful! Aw, Happy Birthday, Momma! My mom is still my mom! And this cake is luscious looking! Now that my husband is on a diet I have not thought to look for sweet recipes on Cooking Light. Thanks for the flash (duh!) and this gorgeous, tempting recipe! Well, happy birthday to your momma, Shelby! So nice to get together and celebrate with this wonderful homemade cake. Happy Birthday MOMMA!!!! Yummy cake. Save me any? I see where your good looks come from!! Happy Birthday to Shelby's Momma!! Yum! That looks and sounds delicious to me! This looks so beautiful! You did a fabulous job Shelby! Happy b-day to your Mom! The cake looks so beautiful. Just saw your pic of this cake that got published on Photograzing. I thought, "I know her!" Congrats!!! Great picture! Ooh, that cake looks divine. I love all things banana! Such a pretty cake, happy b'day to your mom! You always make the most gorgeous cakes! Looks delicious, and I do hope your momma had a great birthday! What a beautiful cake! Your photos have me drooling, Shelby! I love lemon & blueberries together. I wish I could dive into a slice of this right now!! Drooling! 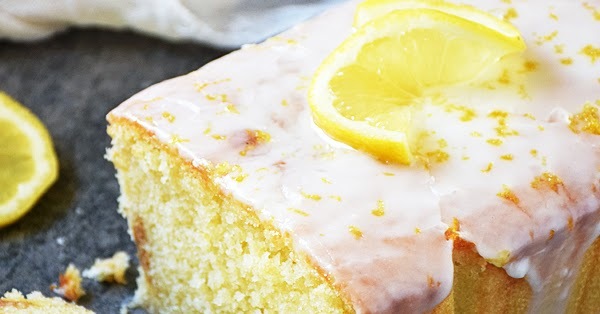 So pretty and impressive, especially with the lemon zest peeking through the frosting. 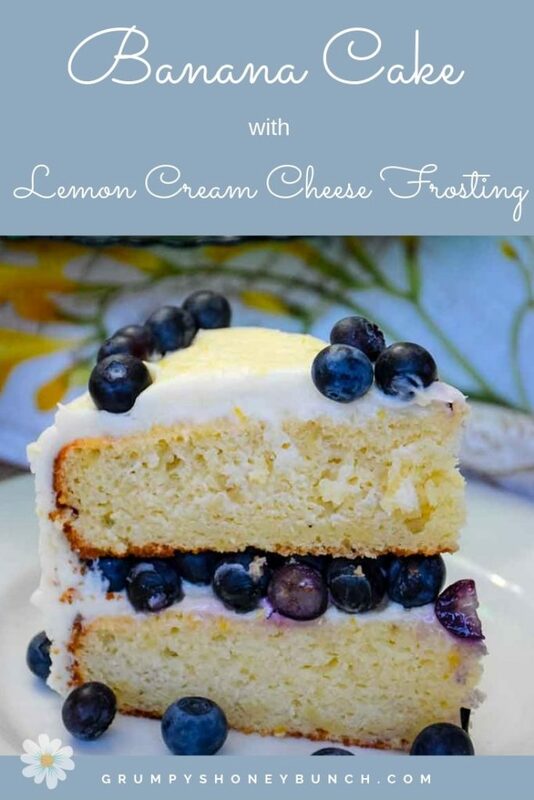 Great flavor combinations too with the lemon, blueberry and cream cheese. What a beautiful cake you made for your mom, love the flavor combo. I can see why your mom had such a huge smile on her face when presented with this cake and the fact that you are still making it all these years later speaks volumes about the flavor. Yum, I bet your mom was very happy to have this for her birthday. Looks delicious with either blueberries or blackberries.